From the parrot sketch to heading up the Ministry of Silly Walks, John Cleese is one of the funniest, influential and instantly recognisable comedic actors in the world. Fans of comedy will instantly recognize John Cleese: a co-founder of the groundbreaking and influential British television comedy Monty Python’s Flying Circus, Cleese later went on to further success on British television, playing beleagured hotelier Basil Fawlty in Fawlty Towers. 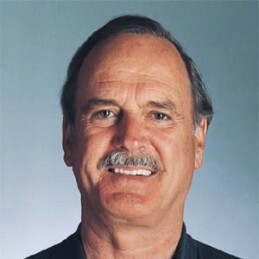 Cleese has continued his acting career, with recurring roles in the popular Harry Potter film series and the James Bond film series. He is, however, more than a comic. Cleese authored two internationally best selling books on psychology, Families and How to Survive Them and Life and How to Survive It. He also spent 20 years helping run Video Arts, a company that produced management and sales training films. Cleese’s humorous presentations help businesses understand the difference between successful customer service – and what can happen when it goes horribly awry. Cleese shows you how an element of creativity in the business world can reap untold dividends, from recruitment, training and retaining employees, to better and more enjoyable customer service, to helping businesses innovate and accommodate change.